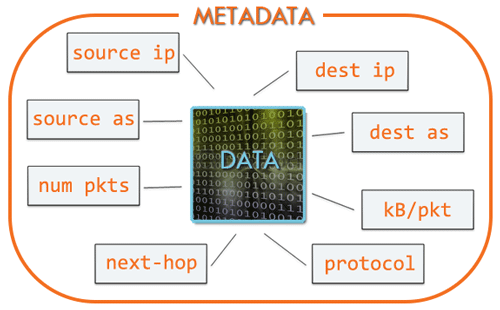 NetFlow is a protocol used to collect metadata on IP traffic flows traversing a network device. Developed by Cisco Systems, NetFlow is a protocol that is used to record metadata about IP traffic flows traversing a network device such as a router, switch, or host. A NetFlow-enabled device generates metadata at the interface level and sends this information to a flow collector, where the flow records are stored to enable network traffic analytics. A network operator can use NetFlow data to determine network throughput, packet loss, and traffic congestion at a specific interface level. NetFlow data also supports other network-level monitoring use cases such as DDoS detection and BGP peering. NetFlow is the technology and term used exclusively by Cisco Systems. IPFIX is an IETF standard flow record format that is very similar in approach and structure to NetFlow v9 (see more on version numbering below). It is sometimes called “NetFlow v10” since IPFIX plays a key role in coalescing all NetFlow variants and equivalents as the standards process evolves the IPFIX specifications over time. sFlow is a similar but importantly different type of flow protocol and data record standard introduced and promoted by InMon Corp. sFlow does not sample all packets like NetFlow does, nor does it timestamp traffic flows. It relies on accurate and reliable statistical sampling methods for documenting flows, thereby reducing the amount of flow information that ultimately needs processing and analysis. xFlow, while not a variant, is the generic term often used to refer collectively to all flow record variants (NetFlow, sFlow, IPFIX, J-Flow, etc.). Exporter: A NetFlow-enabled device that generates flow records and periodically exports them to a flow collector. Collector: A program running on a server that is responsible for receiving, storing, and pre-processing flow records received from NetFlow-enabled devices. Application: An analysis application that processes flow records collected by the flow collector into reports, alerts, and other interpreted results. These same attributes that define a given set of packet as a flow make up the core metadata (information about the flow rather than the information that’s actually in the packets) that is included in the NetFlow “flow record” for that flow. Each time a new unidirectional IP traffic flow starts traversing a device a new NetFlow flow record is created and tracked in the device’s on-board cache. The flow is inactive (no new packets received) for a duration defined in a timer. Timers are configurable but defaults are typically used. The flow is long-lived (active) but lasts for longer than the active timer (e.g. a long FTP download). A TCP flag (i.e. FIN, RST) indicates that the flow is terminated. v1: First implementation, now obsolete, and restricted to IPv4 (without IP mask and AS Numbers). v2: Cisco internal version, never released. v3: Cisco internal version, never released. v4: Cisco internal version, never released. v5: First commonly deployed version, available (as of 2009) on many routers from different brands, but restricted to IPv4 flows. v6: No longer supported by Cisco. v7: Like version 5 with a source router field. To learn more about NetFlow extensibility, see Avi Freedman’s blog post on NetFlow, sFlow, and Flow Extensibility. To learn more about how Kentik delivers unbounded, ad-hoc analysis on huge NetFlow volumes, read the Kentik Detect overview. Related Kentipdia entry: NetFlow Analysis.